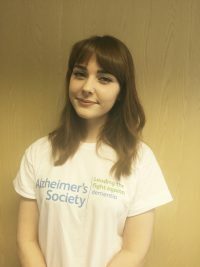 A member of the New Directions Cardiff Primary Team will be pulling on her climbing boots and completing the Alzheimer’s Snowden Midnight Challenge on Friday May 13th 2016. Rachel Jones (pictured) who works as Sales Support for the supply agency team has been working tirelessly to prepare, and also to raise funds for a cause she describes as very close to her heart. Rachel has held a number of events raise money including a very popular bake-off challenge. Speaking about the fundraising Rachel comments ‘I was very appreciative of the support not only from my team but the company, people were very keen to volunteer their cake baking skills’. Anna Powell, Branch Manager for the New Directions Cardiff Team added ‘the whole community within our offices has come together to support this fundraising effort. It’s testament to Rachel’s commitment that everyone engaged so well’. The challenge will take the team of fundraisers between five and seven hours to reach the peak, and then a further two hours to make the descent. The mountain measures a staggering 1,085 metres high. Rachel will hope to raise further funds from sponsorship upon completion of the climb.